Using Direct-to-Paper Technique, swipe all colors of Verona Petal Point Pad on black card stock. Emboss with clear powder. Using same inks, apply directly to leaf stamp and stamp on black card. Emboss with clear powder. Cut out (we used deckle edge scissors) and edge with gold pen. 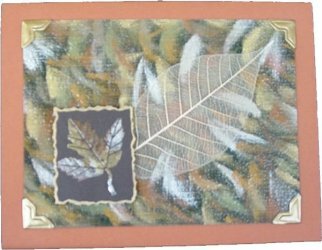 Layer to background with skeleton leaf. Attach gold photo corners and layer to rust card. 1253D Maple Leaf, bold, med.